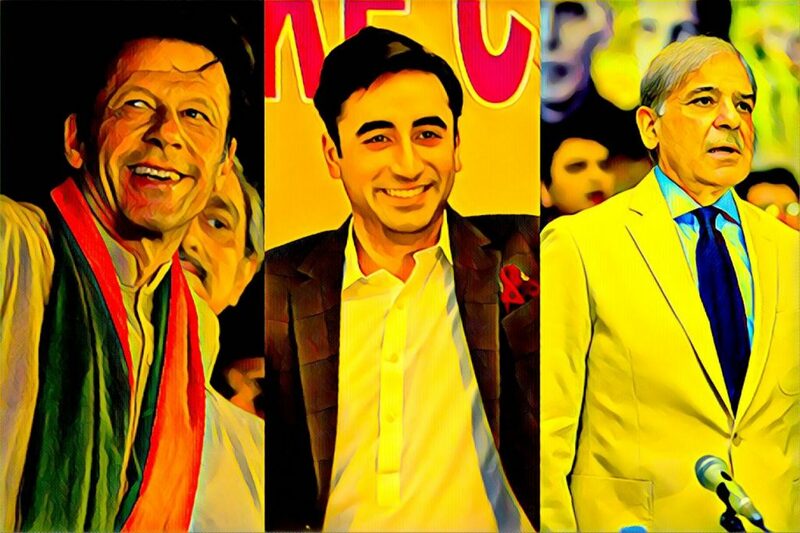 With less than 10 days to go for Pakistan General Elections 2018, key contesting political parties are propagating their manifestos addressing focal areas of progress for the country. In the last few years, Pakistan may have emerged as the fifth largest emerging economy. However, it is still coping to build a digital economy and a stable ecosystem for entrepreneurship which can be detrimental for the country’s economy in the years to come. The former government had launched various initiatives to provide a bedrock for the digital economy for Pakistan. Be it entrepreneurial initiatives for youth, research centres for academia or tax incentives for the digital industry. The question now emerges, how much focus has all contesting political parties put on the agenda for continuing to strengthen the local technology and entrepreneurial ecosystem. It should be noted here that a digital ecosystem is not limited to IT exports or tech startups only. It also encompasses a wider area of leveraging technology through R&D for solving urban and rural challenges, building an infrastructure for e-governance, driving tech innovations in the social sector and building the next generation of digital workforce. During the campaign trails, the first party to announce technology as a priority area has been Pakistan Tehreek-e-Insaaf (PTI) by launching their 14-point Digital Policy. Ahead of the elections, the policy has been the first notable effort by any major political party to focus on the long-term goals to improve Pakistan’s standing in the digital domain. The policy was followed by the manifesto of Pakistan People’s Party (PPP) that contains a three-pronged approach for the advancement of the local IT sector. The approach falls short on chalking out an action plan and revolves around only introducing critical policy statements and regulatory frameworks. Seems to be added as an afterthought, the technology agenda in the PPP manifesto failed to address education-related incentives and e-governance. 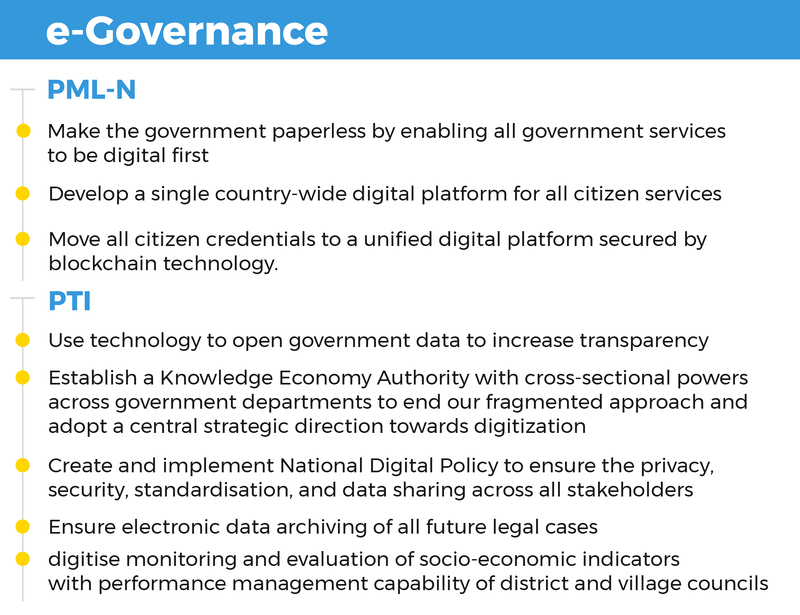 Given the understanding of the technology and entrepreneurial sector that Pakistan Muslim League (PML-N) gained in their past tenure, their manifesto necessarily puts a strong focus on Digitising Pakistan and it does so with an action plan. Major incentives already piloted in Punjab are mentioned to be expanded across the country with a strong focus on digitizing citizen services. According to Pakistan Telecom Authority, less than 30 per cent population of Pakistan has access to the internet, be it broadband or 3G/4G services. 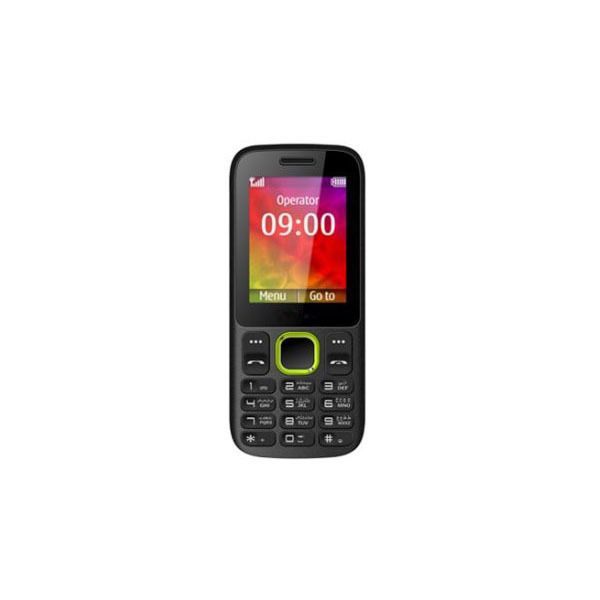 Mobile penetration also stands below 70 per cent. In order to accelerate digital inclusion, increased mobile and broadband penetrations should be a priority agenda for the elected political party. 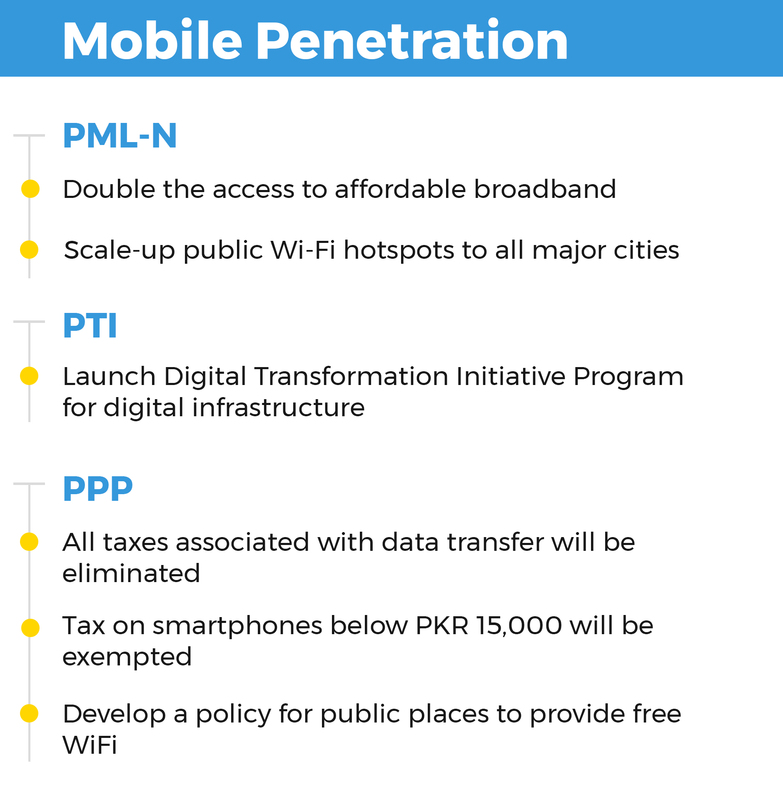 PML-N’s aim to cut down the cost of broadband access can be effective as a short-term goal to increase internet access, while PTI’s approach to build a larger digital infrastructure will be key to national transformation. The entrepreneurial ecosystem of Pakistan is still evolving in its nascent stage. Various incubation centres have been established across major cities, including the five National Incubation Centers launched by Ministry of IT & Telecom in collaboration with Ignite. However, Pakistan has yet to produce a unicorn. The ecosystem finds itself struggling to attract international venture capitalists and angel funds. There is also a lack of local investors that can facilitate startups to scale up across the country and later enter the global market. Compared to the neighbouring country, Startup India action plan has enabled Indian startups to accelerate their growth by seeking facilitation through a whopping INR 10,000 crore funding pool, tax exemption, reduced patent fees, and an improved bankruptcy code. Support for startups does not end at building a funding pool, but it also requires critical policy and legislative support. PML-N’s plan to government contributing funds for startup support can be a constructive step if executed in a public-private partnership model. Ignite can be a relevant archetype here, but the ecosystem is in need of a proper VC fund with private management. When it comes to PTI, their focus on normalising the tax structure can be a huge step and unleash tremendous growth in the local sector. IT exports of Pakistan has now expanded to over 100 countries with a growth rate of a whopping 125 percent. The industry has also contributed 98 percent to Pakistan’s economy by foreign exchange earnings. Pakistan Software Houses Association (P@SHA) has actively engaged with the former government to put forth the concerns and interests of tech industry stakeholders. Their pursuit of discourse with the government has lead to the announcement of critical policy statements, tax holiday, economic benefits and Special Economic Zones (SEZs) for the IT sector. The federal cabinet also passed Pakistan’s first Digital Policy in the tenure of the past government. All that is required now, is to keep the momentum going, with an improved technology policy, global collaborations, and infrastructural investments. Both PTI and PML-N understand the importance of dedicated Special Economic Zones (SEZs) and clusters for technology. It is the best way forward for the growth of the industry. The previous government was also working on this technology SEZ model with P@SHA. 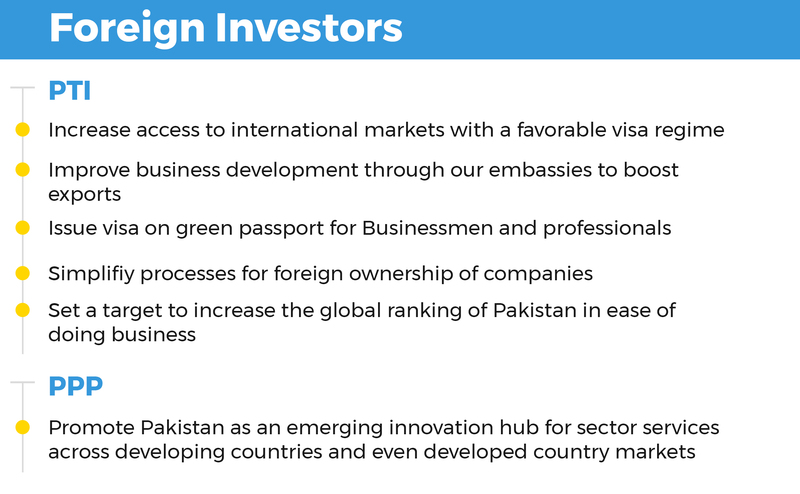 Moreover, PTI’s focus on using the expat community and working on the image problem for Pakistan is going to the root of the reluctance of foreign investors coming to Pakistan. The e-commerce sector of Pakistan seems to be thriving and is expected to hit $1 billion mark in the current fiscal year. However, when it comes to e-commerce readiness, Pakistan ranks 120th. It can be attributed to the comparative lack of logistics solutions and digital payments as required for the nascent e-commerce industry. While broadband penetration has accelerated the growth of e-commerce, the fintech industry is still struggling to develop a strong foothold in terms of infrastructure and quality of services. Consumers and businesses alike are finding it difficult to move towards digital transactions. According to the Asian Development Bank, 95 per cent of e-commerce sales in Pakistan opt for Cash on Delivery (CoD) instead of digital payment methods. PML-N’s focus on e-procurement across all public departments will create a lot of demand for local vendors. 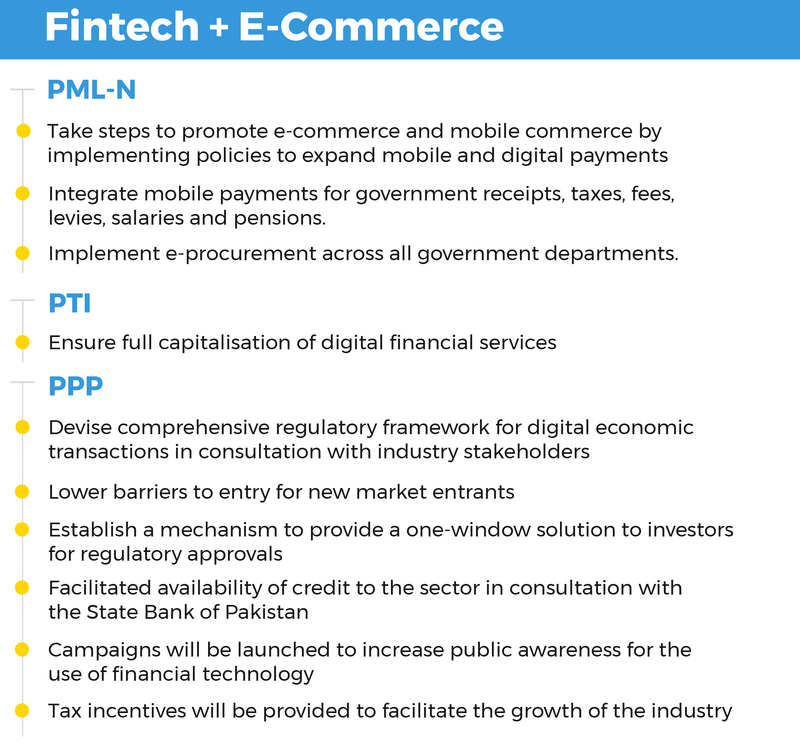 Whereas, PTI’s focus on financial services can strengthen the backbone for e-commerce. Furthermore, PPP’s priority of providing easy credit to this sector can prove to be groundbreaking for the sector. Pakistan has yet to see a billion dollar company – and government and local infrastructure will play a huge role to attract investments in the technology sector. Pakistan has the capacity and human resource to build products for global markets, however, red-tape and bureaucratic procedures chase away foreign partners. It has now become increasingly important, not only for startups but major software companies that are developing IT products or providing IT enabled service to raise investments and expand outside Pakistan. PML-N has already been working on ease of doing business and so has PPP in Sindh. PTI’s focus on easier visa and travel for both inbound and outbound professional will critical for our sector as currently, it stands as one of the major hurdles faced by the local sector. Not only developed countries but also developing countries across the globe are harnessing the power of technology and data to enable transparent and efficient governance. When it comes to Pakistan, the data collection and record keeping of various public departments is antiquated. There is a lack of coordination between these departments and it only increases from federal to provincial levels. It is time that the elected government automate and digitize citizen services to cut back on resources and ensure better efficiency. PML-N has already done remarkable work on e-services in Punjab. PTI’s proposal of making a central Knowledge Economy Authority is really visionary as all the countries that have transformed digitally have taken this ownership at the highest level, whether it is Modi’s Digital India or Netanyahu promoting Israel as a Startup Nation. The future of skills is digital. Digital Pakistan cannot only be a possibility with an infrastructure and investments, but academia also has to play a significant role to build the next generation of technology experts. While initiatives to impart digital skills as a vocational training can help provide sustainable livelihoods. Pakistan also has the 5th largest number of freelancers. However, to drive excellence in innovation and research, Pakistan will have to be aggressive to not miss out on the fourth industrial revolution. 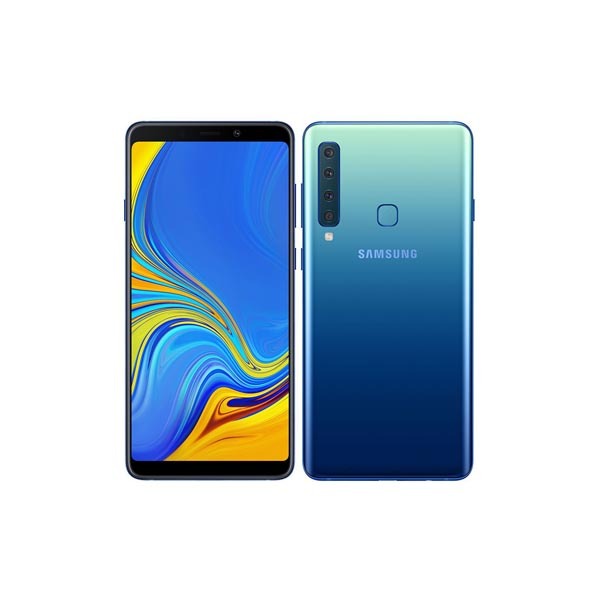 In contrast, Make in India campaign has helped India to attract Apple, Samsung, Oppo and other smartphone makers that are now setting up their manufacturing units in India. PML-N’s e-Rozgaar and its future focus on apprenticeship can produce high-skilled workers. While PTI’s focus on promoting and subsidizing IT education will also have a far-reaching impact on local job market and Pakistan’s international standing. TechJuice has now completed a detailed insight into the holistic vision of these major political parties’ manifestos to bring about the transformation of Digital Pakistan. It is a remarkable sign to see these parties focusing on the IT sector and including it as a key focus area in their respective manifestos. The sooner the elected government realize that technology will be the engine of growth, the faster we will fuel a digital economy. Thank you Shehryar Hydri, Secretary General at Pakistan Software Houses Association (P@SHA), for providing insights and feedback for this feature before publishing.